I've got a fun makeover for you all. I was challenged to do a makeover for a model with a floral headpiece and a bright green tropical dress. What kind of makeup would you do? Check out my look below! I wanted to work with color without making it overly tacky. 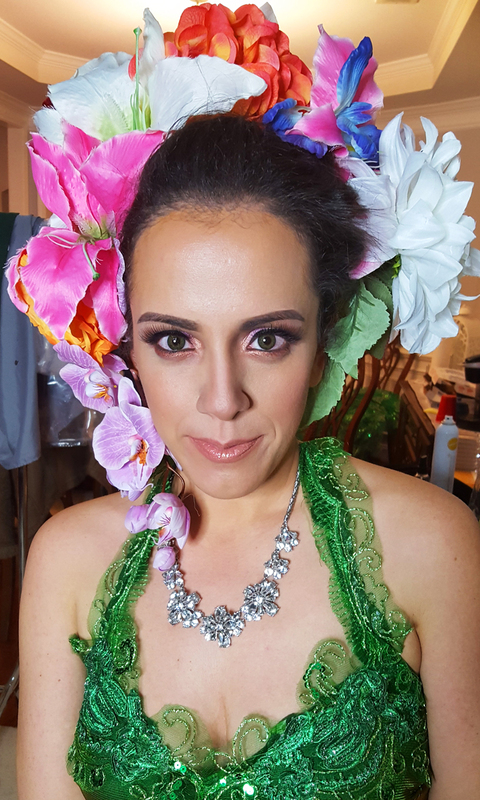 This head piece and dress was previously worn for the pageant Mrs. Universe and Mrs. Puerto Rico was representing the lush rainforests of her country. I wanted to work with color but not make it tacky. There were a lot of colors to choose from but I went with pinks, coppers and purples which were located in the floral head piece. I wasn't sure how it would turn out, but it came out very elegant yet still colorful. I can't wait for you all to see the final pics, stay tuned!